PRAGUE -- A robotic spacecraft bound for lunar orbit blasted off from China on Friday, beginning the next phase of that country's program to explore the moon with unmanned probes. Chang'e 2 is beginning a five-day journey to the moon, where it will enter orbit about 60 miles above the surface with better science instruments and more fuel than its predecessor. The spacecraft was built as a ground spare for Chang'e 1, which launched in October 2007, in case that mission ran into problems. Instead of building a new probe, China bolted improved science instruments and cameras on the spare and launched it on a more powerful rocket. The $134 million mission launched at 1059:57 GMT (6:59:57 a.m. EDT) Friday from the Xichang space center in southwestern China's Sichuan province. The historic mission was broadcast live on CCTV, China's state-run television network. Crowds of well-wishers also packed into Xichang, a facility normally off-limits to the public. Tourism groups sold tickets for up-close viewing of the launch, but visibility was limited by clouds in the area. Friday was also National Day in China, marking the 61st anniversary of Communist rule there. The three-stage Long March 3C rocket blasted off from Launch Pad No. 2 at Xichang, turning southeast from the space base and entering space a few minutes after liftoff. The launcher's hydrogen-fueled third stage fired twice to push the 5,500-pound craft into a transfer orbit toward the moon. The satellite separated from the rocket less than 30 minutes into flight and was expected to unfurl its solar panels and communications antennas. Chang'e 2 will be captured by the moon's gravity and arrive in lunar orbit in 112 hours, or just shy of five days, according to the state-owned Xinhua news agency. It took 12 days for Chang'e 1 to reach lunar orbit after launch on the less powerful Long March 3A booster. The probe is designed to observe the moon for at least six months, but it carries enough fuel to operate much longer. Its closest approach to the moon will be at an altitude of just 15 kilometers, or about 9 miles, according to China. 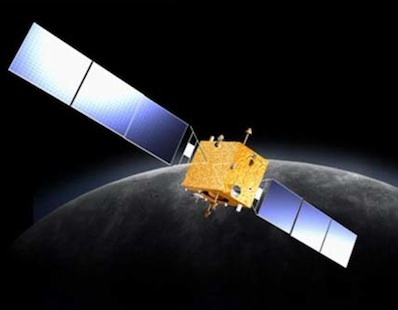 After its baseline mission at the moon is finished, Xinhua reports Chang'e 2 could enter an extended phase.